Many thanks to China Airen who took the time to make a subbed video. Please note, these are not my translations. It would’ve been great to get a video subbed with them, but I simply didn’t have the time. Also, special thanks to Jessica Jai who uploaded this video. Your hardwork in translating, subbing, and encoding is much appreciated. Categories: Documentary, translation, Video | Tags: 2 sons, China Airen, deaf father, documentary, Donghaeng, English subbed, Episode 8, video, volunteer | Permalink. This is a long clip and you can get a feel for the emotions conveyed in this episode of Donghaeng even if I uploaded it raw. However, I think understanding what is being said brings a whole new level of appreciation for the volunteers and Lee Seung Gi. It is truly a heartwarming story. Female voice: Although he can’t hear the sounds of the world, thanks to his reliable sons, it’s Mr. Hong Chul. These situations only make Dad flustered. Lee Seung Gi in sign language: I am called Lee Seung Gi. Do you know me? Female voice: To the father and 2 sons, it was a very special day. A small rural middle school is bustling with energy. Today is graduation day. However, there was another guest besides Dad who came to congratulate Sang Hoon. Lee Seung Gi: I carefully thought about it and honestly, I didn’t even go to my younger sister’s graduation. Today happens to be Sang Hoon’s graduation. If I can take a photo with him at graduation, I thought it would be a good memory for Sang Hoon so I changed my schedule and came to the school. Male voice: It will be an amazing gift for Sang Hoon. Lee Seung Gi: Yes, but, since the first meeting is here, I’m thinking that Sang Hoon may feel awkward and shy. Female voice: Seung Gi, who has always been with Donghaeng for the past 5 years, made a surprise visit here. Seung Gi approaches Dad first. The classroom was buzzing with excitement with an unexpected appearance of a celebrity. Lee Seung Gi: Sang Hoon, for starters, congratulations. Do you all know me? Thank you very much. I heard today was graduation so I came thinking it would be a surprise gift. You’ve finished 3 years of your days in middle school and you’ll have to start a new beginning in high school. Anyway, just like now, study diligently looking cool and I hope you will achieve your desired goals. Congratulations! Congratulations to you too, Sang Hoon. Female voice: Dad was also surprised. Lee Seung Gi: Here, I made this for you. Lee Seung Gi signing to Sang Hoon’s Dad: I am called Lee Seung Gi. Do you know me? Sang Hoon’s Dad: Of course I do. I’m glad to meet you. Lee Seung Gi: I’m also glad to meet you. Sang Hoon’s Dad: I didn’t know you would come. I was surprised because you suddenly came. Lee Seung Gi: I also wanted to be of help in some way so I came. I’m also very worried about your eyes. Sang Hoon’s Dad: Thank you very much. Lee Seung Gi: I think he’s really amazing and very cool. (To Sang Hoon’s Dad:) Despite the fact that your eyesight isn’t very good yet you continue (to work hard) touched my heart. That’s why I came. Sang Hoon’s Dad: Thank you for looking upon me like that. Seeing you makes me very happy and it’s a moving day for me. I’m really happy. I gain strength and courage. Lee Seung Gi: Although I can’t do sign language, everything is relayed through the body. Female voice: Seung Gi, who has provided a special graduation filled with memories. Lee Seung Gi: Hey, aren’t you not allowed to get (my autograph) on your diploma? Female voice: Although the classroom became a zoo in the blink of an eye, everyone appears to be having fun. Sang Hoon’s Dad: Even though I haven’t attended school, watching the kids receive their diplomas and having fun makes me feel good. Again, I’m moved and it would be nice if the kids achieved their dreams. Lee Seung Gi: You’re Sang Min, the younger brother, right? Where were you? Really? Hey, Sang Min, you have to smile. Female voice: Seung Gi who personally wanted to take a photo for Sang Hoon’s family. Today seems like it will be an unforgettable day for Sang Hoon and his friends. Lee Seung Gi: Where did all your friends go? What did they eat? Oh really? Female voice: A menu item that can’t be omitted on graduation day is jjajangmyun (noodles in black bean sauce), right? Lee Seung Gi as he enters the Chinese restaurant: Let’s order all the expensive items here. Female voice: Seung Gi says he will treat the father and two sons today. Sang Min: Is today’s menu a bit disappointing? Sang Hoon: No. I like it but I’m feeling flustered so I don’t know what to do. Sang Min: What about? Because you’re in front of Seung Gi hyung? Sang Min: Please come to my graduation next year. Female voice: Seung Gi really wanted to meet the three after watching the broadcast. He said he felt the family’s warm hearts exactly as they were through the screen. Lee Seung Gi: You know that your father is a really distinguished person, right? Lee Seung Gi: Of course. Sangmin: I am grateful everyday. Lee Seung Gi: That’s why, I really, really mean it. I think it’s difficult to say that someone who has a fancy job and a lot of money is distinguished. That’s what I’m saying. I was also moved so I came all the way here. (To Sang Hoon’s father) Probably, since I felt this much, many others around you will have seen the way you live and will be moved and want to help. Sang Hoon’s Dad: Thank you for speaking that way. Female voice: He also personally chose Sang Hoon and Sang Min’s gifts. Lee Seung Gi: Graduation gift. To study hard. Female voice: Today, Seung Gi and the three share each other’s hearts in this way. Lee Seung Gi: There are many times when one becomes uncomfortable and despairs over little things. Also, one can think it’s a huge handicap. But when one looks at it, there are people in inadequate situations much worse than me who have overcome them. Inside that, they also find happiness. That’s an amazing thing. We already have so many things but still worry because we’re not happy. When we look at things, despite the fact that we don’t see anything noticeable, finding happiness within that is remarkable. Female voice: Already day 10 of construction. Seung Gi has come to see Sang Hoon’s family again. Lee Seung Gi: What do I have to do? Male volunteer: Please clear this away and bring panels over here and hold them. Female voice: Seung Gi who looked for work as soon as he arrived. Lee Seung Gi: I can’t balance this. Female voice: Seeing Seung Gi again, Dad seems happy. Lee Seung Gi: This much isn’t a big deal. It’s just that I don’t have the knack for it. While I’m carrying these panels now, I don’t want them to become damaged. That’s why I’m carrying them carefully. Female voice: He said he came to this site to help in the construction of Sang Hoon’s house. Volunteer: Many people gathered their hearts and are doing construction work. Lee Seung Gi: I’m really thankful. I think they’re remarkable. Right now, I’m really happy. Because many people are gathered together, I think it will be a heartwarming house. Female volunteer to Seung Gi: Because you’re here, I think history will be made. Lee Seung Gi: It will turn out well. Female voice: Hoping that Sang Hoon’s family will be happy for a long, long time in a warm house. Forgetting painful memories of the past and hoping they will only have happy dreams in the future. Lee Seung Gi: This is a house where you have to pick each (piece) directly by hand. Every time you step on this area, you’ll remember this very well. Sang Hoon: Because it is a house that others built diligently, I think I will take care of it very much. Lee Seung Gi: That’s right, that’s all you have to do. Sang Hoon: On top of that, Seung Gi hyung also helped. Lee Seung Gi: Aigoo, it’s not like I’m the only one that came. Male interviewer: What kind of house would you like this to be? Lee Seung Gi: Just a house where our three family members would want to come home to. Isn’t that enough? A house where one wants to go home to as soon as possible. Female voice: Seung Gi’s appearance also gives strength to the volunteers. Female volunteer: Mr. Lee Seung Gi! Can I look at you one more time? (laughs and waves with gloved hands) Because he isn’t seen readily, I asked where he went and I get to see him in person here, wow! Female voice: One gets to realize once again that work that can’t be done alone is always possible when many hearts come together. Like this, snacks made with the heart are finished. Female volunteer: Snacks have arrived. It’s kimchi pancakes. Male volunteer: Wow! Thank you. Female voice: More than anyone who has been dripping in sweat and waiting for this moment is Seung Gi. But by any chance, are they people he knows? Lee Seung Gi: Aigoo, you’ve worked so hard. You prepared all of this? Lee Seung Gi: Gosh, really. This isn’t for the faint hearted. Male interviewer: They seem to be familiar people to you. Lee Seung Gi: They’re my fans who’ve been with me for a long time. Female fan: It’s an honor for me. Honestly, since he does a lot of volunteer work and helps many people in difficult situations, fans have continually participated as well. In any case, I’m very happy that we’re able to be together in the same place. Female voice: Could there be anything better than a delicious snack after hard labor? It’s a more enjoyable time because they’re together. Lee Seung Gi: Come! Go over there! Clear this away. Female voice: During this time, Sang Hoon’s family has grown. Lee Seung Gi: She gave birth to two calves. Female voice: Taking care of two recently born calves have become a major part of Sang Hoon and Sang Min’s daily chores. Father’s mind has become reassured. Lee Seung Gi: This one’s fur is whiter. Since you also have a new house due to the care and attention of many people, I’d like your family to live healthily and happily. It was really enjoyable. I really had a lot of fun. As expected, (I felt) peoples’ warmth. Once again, I felt how much strength can be derived when many people gather together. This is a gift. Female voice: Time to say goodbye. Lee Seung Gi: Since the rice will cook well, always have three delicious meals a day. Sang Hoon, now you have to make the rice. Female voice: Starting with a rice cooker for the family of three to cleaning tools and even various household goods. Female voice: He brought all the necessary items for a new house. Lee Seung Gi: Father, always be healthy. Sang Hoon’s Dad: Mr. Lee Seung Gi, you too. Female voice: Filled with a regrettable heart, he hugs him tightly. Lee Seung Gi: You’re going to work diligently, right? Sang Hoon, you too. Female voice: A meeting that could be called long or short. But, since it was a time where they could share their sincerity, it will be able to remain in their hearts as a warm memory for a long time. Around the time father stopped his hot tears, people led him into the living room. Lee Seung Gi: Father, Sang Hoon, Sang Min, do you like the house? I had a great trip, Father. Many people’s hearts gathered together and built this house. I hope all 3 members of the family will like it. Since there’s always many people next to you who are able to cheer you on and help you, never lose courage and hope. I hope that this house will be filled with happiness and only good things. To the best dad, I am cheering you on. I promise to go together with you. Categories: Documentary, Video | Tags: deaf father, Donghaeng, Episode 8, translation, two sons, video | Permalink. Seung Gi: I am called Lee Seung Gi. Do you know me? Mr. Hong Chul: Of course I do. I’m glad to meet you. Seung Gi: I’m also glad to meet you. To the best dad, I am cheering you on. I promise to go together with you. Categories: Documentary, translation, Video | Tags: deaf father, Donghaeng, Episode 8, sign language, translation | Permalink. Do you remember February 3rd’s “Popped Grain Father and His Two Sons” regrettable situation? Through a project prepared by the station, Lee Seung Gi, and viewers, we look back on the meaning of sharing and donghaeng (means “to go together” in Korean). Categories: Documentary, News, translation, Video | Tags: Donghaeng, Lunar New Year Special, volunteer | Permalink. Lee Seung Gi will appear in Episode 8 of KBS1’s Donghaeng scheduled to air during the Lunar New Year holiday weekend on 2/21 at 6pmKST. Donghaeng means “to travel together”. Here’s the trailer from Donghaeng’s official facebook page. Lee Seung Gi: Volunteering, it’s not really a difficult thing. Once again, I felt how much strength can be derived when many people gather together. Woman volunteer: If done alone, it’s going to be a very difficult job. But when many gather together, it’s more fun. Closing caption: A warm donghaeng made from the gathering of many people’s hearts. Categories: Documentary, Facebook, translation, Video | Tags: blind father and sons, Donghaeng, KBS1, Lunar New Year, translation, volunteer work | Permalink. Singer/Actor Lee Seung Gi had a warm meeting with those appearing on KBS 1TV’s ‘Donghaeng’ through the Lunar New Year Special. Lee Seung Gi, who already has consistently sponsored ‘Donghaeng’ for the past 5 years, met with those appearing on the newly established ‘Donghaeng’ special in January. He also personally volunteered and showed his consistent affection for ‘Donghaeng’. On January 3rd, Lee Seung Gi encountered the family broadcasted on episode 1 of ‘Donghaeng’ titled ‘A Father and His Two Sons’ Hopeful Popped Grain’. This episode was a warm story about Mr. Hong Chul who is congenitally deaf. Although he can’t hear the sounds of the world, more than anyone, he diligently sells popped grain at the market and raises 2 sons. Firstly, Lee Seung Gi attended Mr. Hong Chul’s eldest son Sang Hoon’s graduation ceremony and held a surprise event for him and his friends to congratulate them. 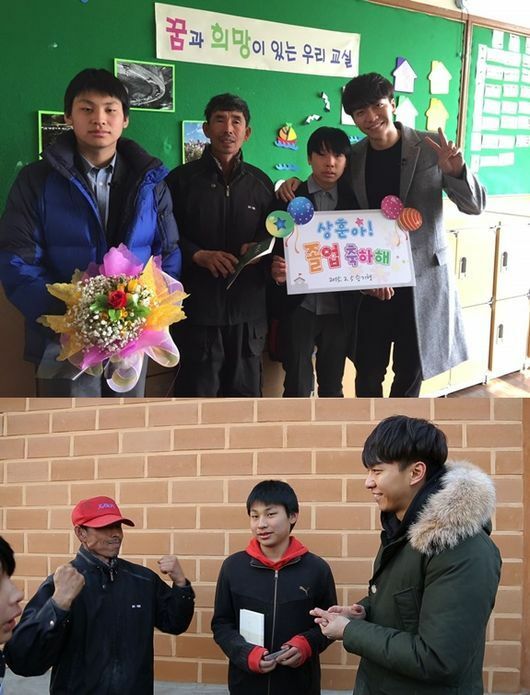 In addition, Lee Seung Gi and members of his fan club volunteered together by going to the site of Mr. Hong Chul’s family’s worn down house and spending meaningful time supporting a new start for his family. ‘Donghaeng’ is a program which tells the story of our neighbors who don’t lose hope despite living in difficult situations and helps them to become self reliant. Lee Seung Gi and the warm story of a father and his 2 sons will be broadcast this coming 21st at 6pm. Categories: article, Documentary, News, Photos, Press, translation | Permalink.